Arizona state Rep. Don Shooter, R-Yuma, reads a statement regarding sexual harassment and other misconduct complaints made against him by Rep. Michelle Ugenti-Rita and others, on the House floor at the Capitol in Phoenix. (CNN) - In a nearly unanimous vote, the Arizona House of Representatives expelled a Republican member after a report found he engaged in a pattern of sexual harassment. 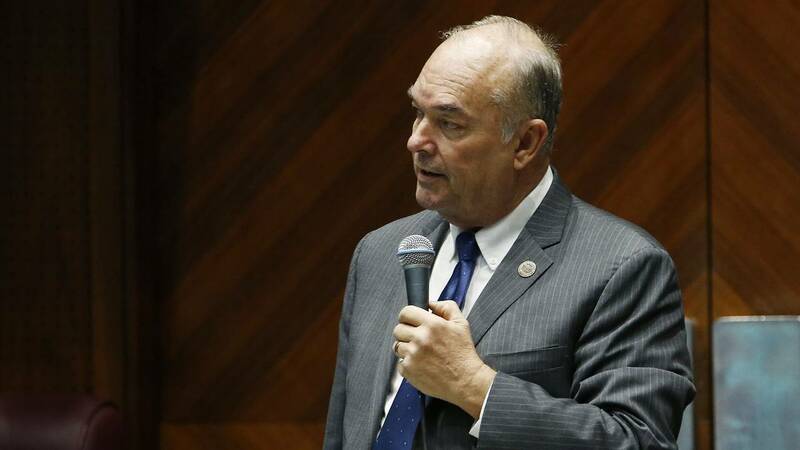 The chamber voted 56-3 to oust Republican Rep. Don Shooter on Thursday, marking the first time a state lawmaker has been expelled from office since the start of the #MeToo movement. Recently, US senators and representatives in Washington who faced sexual allegations and ethics investigations chose to resign or not run for reelection. CNN's calls to Shooter's office were redirected to the House majority staff's communications office, which refereed CNN to a statement by the Republican House speaker, J.D. Mesnard, in which he announced his push for Shooter's expulsion. Mesnard's statement referred to a letter Shooter wrote regarding the allegations against him as "a clear act of retaliation and intimidation, and yet another violation of the House's harassment policy." Shooter told the Associated Press he did not do anything to deserve expulsion. "I've had two, three months to think about this. I did wrong, I deserve a censure," Shooter said. "But I'll tell you this. I was sent here by the people of District 13. And to the best of my knowledge, I've never betrayed that trust, never, never. Not for monkey business, not for contributions, not for influence, not for power, not for anything. On the House floor, before the vote was final, Shooter pleaded for the House to allow him to stay. "I've said stupid things. I've done stupid things. I stood on the carpet, I took it like a man, I apologized," Shooter said. "I can't go back to the past. I can't change it. But I can change the future if given the opportunity." He then dropped his microphone and left the statehouse smiling, according to local CNN affiliate KNXV. Several women, including fellow Republican Rep. Michelle Ugenti-Rita, who was the first to go public with her allegations, accused Shooter of making inappropriate comments, unwanted sexual advances, or crude gestures either directed at them or in their presence over his nearly seven years in the Arizona legislature. The allegations against Shooter prompted Mesnard to call for an investigation last fall. The investigation's findings were finally released in a report Tuesday, which concluded that there was credible evidence Shooter had violated the House's policy on sexual harassment, but said not all allegations "are supported by independent, credible evidence." Ugenti-Rita accused Shooter of commenting as she left a caucus meeting to breastfeed, "That's one lucky baby. I wish I was that baby," according to the report. Ugenti-Rita also alleged that for Christmas in 2011, Shooter gave her a bottle of tequila and a Christmas card that referenced a country song by Kenny Chesney, "You and Tequlia," with the lyrics "you and tequila make me crazy." Another female Arizona lawmaker, Athena Salman, alleged that during her first interaction with Shooter on the House floor, he told her, "You'll be a nice view to look at," according to the report. Following the report's release, Mesnard sought to censure Shooter as punishment, but then considered expulsion after the letter Shooter wrote to members. In the letter, Shooter accuses investigators of dismissing and omitting from the report an allegation made by an unnamed woman against another lawmaker. Mesnard said Thursday that his difficult decision to hold a vote to consider Shooter's expulsion was because he used this woman as "a pawn" and further victimized this person with his letter. State Republican Rep. David Stringer, who voted against Shooter's expulsion, said he based his decision on what he called "violations of due process." Herschel Fink, the executive director of the Arizona Democratic Party, said in a statement Thursday: "Unequivocally, today's decision by the Arizona House of Representatives is a powerful statement for the brave women who came forward, and a lesson for all those who engage in this unacceptable conduct." "His actions, long history, and defiance to the very end is indicative of the fight our state, and country will face when battling against the widespread prevalence of sexual assault and harassment in our everyday lives."